Ok, guess after several years of this, I should let you in on some of the more interesting facts about yours truly! Random is pretty easy for me, because I am a pretty random person. My thought process never runs in a straight line, but hops, skips and jumps around from topic to topic. Our family conversations run like this, too. You just never know what will happen next! I love art. I could spend hours in museums just looking at paintings, sculptures, and any kind of interesting creations. Unfortunately I live in a small town, so just can't get enough of it. I don't have a musical bone in my body. I joke about it, but would seriously love to have a musical talent transplant. Or even a little gracefulness sprinkled in, because I'm also quite a klutz. I really think these two facts are related somehow. I talk to myself. All the time. Especially in the car when I am alone. It's a little scary. I have a hard time choosing a favorite anything. My husband easily rattles off lists of top 10 movies, foods, football players, things he's done in his life. For me, my favorite thing is the one I am doing right now. Even my favorite color changes as my mood does. And a favorite movie list? Makes me nervous just thinking of trying to rank them! When I am upset and unhappy I clean. Guess I must be happy this week cause my house is a disaster area! I think if I could choose an alternate career, it would be fun to be a stand up comedian. I love to make people laugh. Humor is a great antidote to the trials of life. In reality, the pressure of coming up with new material would probably erase any hint of humor from my life, though! I love chocolate. Any chocolate. I am a huge science fiction fan. Ray Bradbury was one of my favorites growing up. I love the idea of space and exploring the universe. I am a clutter monster. I hate to get rid of anything, but am working hard on this. On the other hand, I absolutely adore modern design with it's clean uncluttered look. Guess I need to seek a middle ground somehow, right? I am very competitive. Must win. I'm not a poor sport and do lose graciously, but believe me, I will ramp it up for next time and get you back! And I guess if you read much here, that I love to write. I hope to do more of that this year, as well as being more disciplined and focused. I feel like much of the time I fly by the seat of my pants, while that is a fun and exciting approach it is not always the most productive. I really would like to take some of the energy I have and use it in a more concentrated manner and see what I can really do instead of just dreaming. I guess that's the New Year sneaking up on me, it's a good time to set goals and make changes. It's like starting fresh, anything can happen! Now I will go put some of these thoughts into action, and clean up my house a bit. Hope you will join me in 2011 and see what we can accomplish! 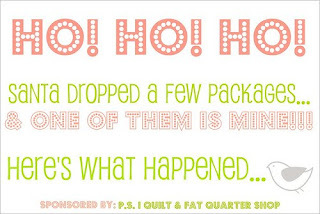 The Last Quilt of 2010? I can't absolutely promise, but I think it quite likely that this will be the last quilt I finish in 2010. Next year I plan to be better about keeping track of how many quilts I actually finish in a year - I know there where quite a few this year, but I'm not sure if I can actually number them all. Maybe over the next couple of days I will see if I can backtrack and figure it out! For the next couple of days I am going to spend some time cleaning up and organizing in my sewing room. I want to make a list of UFOs to finish, as well as a plan for working on some of the other projects that aren't even started yet, but I have purchased supplies for. I hope to be able to finish quite a few of these this year and clean out some breathing room in my space - I'm pretty tired of all the clutter and mess that I seem to deal with on a daily basis. Back to the quilt - I think I am going to call it Dragonfly Dance. It is about 42 inches square and is made from the leftover pieces from another quilt. I actually had some good sized pieces of yardage, plenty to make this quilt top and have a bit of the bright green-blue left for my stash! I put the top together back in October, but hadn't found the right backing for it. I had in mind using some green or blue fabric, but wasn't having any luck finding what I had in mind. Tonight I felt like doing some simple quilting, so decided to look through my stash again and see what I might find, since organizing and clearing out the closet. I immediately spotted a tone on tone black print which was perfect. And there was plenty of it! So, a quick press, baste and I was in business quilting away. I even had a lovely green variegated thread that looks super on the top! Instant gratification, and one more off my list - definitely a pleasant evening! Hopefully I can get a lot of cleaning done tomorrow, then I can do some more quilting - but at least I'm happy getting this one done! Due to a rough ride. By the side of the Ocean. Made by his dear friend. My husband found a recipe that sounded delicious in the newspaper on Tuesday - Eggnog Cake. I am a decent baker, so wasn't worried too much about making it - and we all love Eggnog around here after all, so I was pretty sure it would be a hit. I got in a hurry, and decided instead of going to the store I would substitute regular flour + cornstarch for the cake flour and butter flavored crisco for the butter (yes, I know, it's not the same thing, but the package says that you can substitute it for butter in baking recipes). The batter mixed up great and looked wonderful, but when I checked the cake at the shortest baking time it was definitely still not fully cooked. When I checked it at the longer time, the center had collapsed. Sad. It is a yummy cake, though, and I think I might attempt it again, but will use real butter as well as cake flour next time before I declare the recipe a total loss. On the other hand, the Boston girl and I managed to get an entire quilt top (baby) done yesterday as well as start a second one. She's getting pretty good at this sewing thing! We had a bit of an early Christmas this year - we traveled up to Portland and spent an evening with all 5 of the girls together, just having a fun time. It was lovely! I took lots of (bad) pictures, but got a few cute ones. This is my girls, all in age order from youngest to oldest. Aren't they pretty? Sassy, too, right? We had planned on spending the evening at the zoo, but as it was cold and rainy decided not to do that and had a wonderful time just hanging out, laughing at the grandsons, and eating goodies. It could not have been any better! Now we are back home with our girl from Boston, just taking it easy and enjoying a few days of holiday fun. I made fudge last night and it is way too good to resist. I guess that's why the diet always starts after the New Year comes! Today, we plan on tackling the annual baby quilt marathon. We have three to make, but we have several days to work on them. Today I have assigned the quilter in training to press all her fabric while I go to work and finish the newsletter. Then we will do the cutting and start sewing this afternoon. Should be fun - at leat for me. I think it's a little stressful for her - but she gets better every year! Yes, I have crossed the finish line, picture me - hands upraised, chest out, in full stride with a jubilant smile on my face - victorious! Now that my quilting jobs are done for this season I can start into holiday mode, and I think it will be a lovely one this year, especially being with all of my children - definitely the best gift of all. And Snail's Trail 2 is done also! These were fun to work on also, I loved the bright colors, ijt really is a pick me up during these short winter days to work with bright colors. So, now, my main goal is to get my sewing room cleaned up. I can see some free-cycle posts in my future as well as a few Salvation Army runs. I am asking myself if I really want to work on all of the projects I have piled up. And if I really WILL work on them in the near future. I have a drawer full of tops to quilt, a drawer full of fabric waiting to be made into tops, and piles of fabric waiting for an idea to strike. Not to mention the bin of strips for string blocks. I suppose most of us quilters are like this, too many projects, not enough time! So with that deep thought I am off for the day, I am looking forward to entertaining some friends later this morning and showing my work space to them. 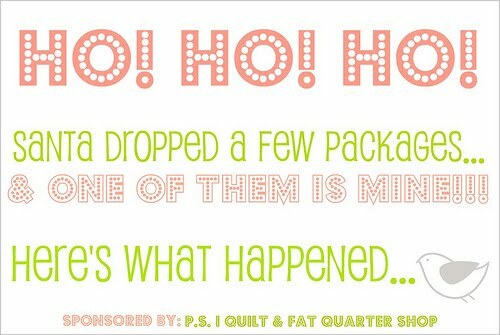 (They are non-quilters, but all are creative so they know how the projects pile up!) I am grateful for sunshine today, for friends, and for finished projects and some free time! I was recently asked to make a project of mine in a much larger size than the original. In more than one way, this project is larger than life....because it is actually a self portrait and the finished quilt is definitely larger than real life! I thought I had already blogged about the progression of this project, but since I can't find the post, I must not have. So I must start at the beginning! 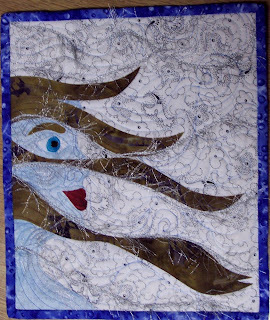 This project had it's beginning in February of 2006 - I was exploring the idea of making journal pages. Unfortunately this was the only one I did that year, but I was really happy with it and always intented to come back and do more. This quilt was a self portrait - me standing in a cold windy Oregon rain. I purposely used a blue fabric for my skin because that's what I remember about that winter was it was cold, wet and windy. I put a New York Beauty block on the back of it, then embelished this side with some sparkly fiber. I quilted it with a lot of McTavishing and echoing. I brought it in to the quilt shop and it ended up hanging with a group of other self-portraits - and is still there! Fast forward a few years, I was out walking on one of those perfect, beautiful fall days and looking up at a clear blue sky through brilliant colored leaves I had the idea to make another quilt using the same basic layout as the first one. After my walk I found the templates I had used for the first piece (after a bit of searching, of course!) and pulled fabric from my stash that reflected the lovely colors of the day. This quilt was more simply finished, just basic outline quilting and no embellishment. I enjoyed it for a while, then decided to add it to my Etsy shop for sale. One more skip forward and we come to the present, and the larger project! I had a request on Etsy to make a larger version of this to cover a futon. Not being one to back down from a challenge, I readily agreed to make it, thinking that with the help of EQ7 it wouldn't be too hard to import my first quilt and creat templates for the pieces. In reality it was more challenging than I thought it would be, but totally worth it! The image was very easy to import into the program. Tracing the pieces was a bit tedious, but not overly difficult. What was hard was making the proportions work. Luckily my daughter was able to assist me so that my face doesn't look like I could have beat Quasimodo out for the crown of King of Fools! This picture is my quilt at the end of the fusing process, before quilting. Another thing I didn't realize when I started it was the challenge that merely handling these large pieces would end up being! Luckily I have a pressing mat for my large cutting table, so that helped immensely, but in order to make my templates for the pieces I had to tape quite a few pieces of paper together, then trace them onto fusible web, then iron the pieces to fabric, cut them out and put it all together. It took me longer than I thought to get it all together, but I am really pleased with the end product! This will definitely be a statement in my customer's room and I am so pleased that my larger Than life Autumn Winds quilt will be enjoyed and appreciated. Does this mean that I might really be able to call myself a "Quilt Artist" after all? Frankly it doesn't matter what I call myself, as long as I enjoy the process I will continue to challenge myself and enjoy what I do - whether it means making traditional blocks, or creating unique works of quilted art! Since Thanksgiving I have been hard at work on a couple of custom quilt orders. One is for two full size quilts done in the Snail's Trail pattern. One quilt will be orange and blue with green highlights. (It is finished and mailed out!) The second is orange and green with blue highlights. I have it cut out and ready to start sewing. They are such bright and happy quilts, it has been nice working on them during the gray and rainy days we've had lately. As you can see - my resident quilt inspector agrees - this was within 5 minutes of me finishing quilting it! I'm taking a quick break before stitching on the second quilt to work on the other project. The second involves me taking a small quilt I made and translating my idea into a larger format, and changing it to a landscape version! It is fun, challenging, a little frightening (fusing large swatches of fabric is definitely not what I am used to doing), and altogether enjoyable! When I finish the large one I will post pictures of them both and let you all tell me what you think of it. And tell the whole story behind the piece as well. And we celebrated our middle daughters birthday today! Happy Birthday, Catie!